A few years back (originally posted in September 2014), I had the great pleasure of being the very first guest blogger on The Lotus Position! Below is my post from their blog on the Recipe for Social Media Marketing Success. I’m dusting it off and breaking back out after a few years as it has some great points that can be followed even today. Be sure to check out The Lotus Position for more great posts on follow @lotus823 on Twitter! Cooking up quality social media and content marketing campaigns can be a daunting task. Like cooking a homemade meal for your entire family, sometimes finding the right recipe and getting started can be the most overwhelming step. While this will serve as a general guide for crafting your own stew of social media success, finding a great marketing agency, skilled social media chef, or online marketing resource can help guide you so you’re not writing your recipe from scratch. There’s no need to reinvent the meal. Now let’s get cooking! Every great recipe starts with great ingredients. Figuring out which ingredients you’ll need, how they’ll be used, and getting them together can be half the effort. Take your time and remember that no matter how complex or clever a recipe is, success can’t happen without all the essential components. One of the first things you’ll need to consider is the scope of your social media and content marketing campaigns. Is your business (or your client) a mom-and-pop catering to a local audience, a large brand with national reach, or somewhere in between? Be pragmatic and don’t stretch yourself or your resources too thin. Once you’ve figured out the general size and depth of your social media endeavors, you’ll need to allocate your resources accordingly. Are you a one-chef show, or do you have a whole kitchen of cooks at your disposal? Taking inventory of whom and what you have to work with along with your estimated serving size should be among the first steps in planning your social media and content marketing strategy. Also keep in mind the next steps you’d need to take to expand in case your campaign grows quickly. Having the right tools to cook with is a must for any chef; you can’t cut veggies without a knife, and you can’t boil water without pots. Consider what hardware (such as cameras for photography) and software (such as Final Cut for video production) you’ll need when it comes to cooking up your content. Before you fire up the stove, there are carrots to be chopped and garlic to be peeled. Get to know the audience you’re trying to reach: research which social media sites they are using the most, identify influential niche blogs and communities, and create user personas. Having an understanding of who your campaigns are for and where they spend their time online will help you to cater to their taste. Once you understand what makes your target audience tick, brainstorm some ideas for content. Organize and outline strategies, write preliminary copy (such as a mission statement) and create social media pages if you haven’t already. Remember, it’s better to be active and engaging on only a few social media sites than inactive on many. Once you have everything you need prepared and your oven warmed up, it’s time to get your hands dirty! When cooking, timing is critical. Ingredients that take longer to cook need to be done first so everything comes together in harmony. Things like SEO need to be simmered over longer periods of time, and assets like videos must be planned, shot and produced. Make sure you give yourself enough lead time with larger projects and make a content calendar to keep everything running on schedule. Mixing up a teaspoon of salt and a tablespoon of salt can ruin even the most carefully planned dishes. Just as you must carefully measure each ingredient as it’s added into a recipe, it’s important to measure the progress of your efforts on every front. Use Google Analytics (or similar tracking services) to monitor traffic to your website, and the various insights/analytics components of your social media pages to see what content is successful and what isn’t. Understanding who is visiting your sites and why will also give you indications on how to tweak your SEO efforts. While an actual dish is prepared completely and then served, social media and online content are constantly being created, served and consumed. Throughout the process of creating and executing your online campaigns, it’s important to dip your finger in to taste your recipe (e.g. feedback and engagement from your audience, staying on-point with your brand messaging) to see what is working best and build upon it. While this goes hand-in-hand with keeping an eye on your online metrics as mentioned in the previous step, making sure you’re achieving the flavor and overall tone you want is a bit more subjective. Even the most delicious traditional recipes can benefit from adding a little kick! Don’t be afraid to be spontaneous and add a little spice to your online marketing. One incredible example of some impromptu zing being thrown into the mix was Oreo’s epic tweet during the Super Bowl XLVII blackout. This ended up being one of the standout moments of the Super Bowl, and it was all done in the heat of the moment. Just like you wouldn’t have an entire meal of just rice, make sure your campaigns are a healthy balance of content, social media, SEO, PR and traditional marketing elements. All of these components working in harmony can create delicious, result-driving success. No matter how delicious a dish is, it might as well be dog food if nobody gets to taste it! Getting the final product to your hungry audience and having it look appetizing is just as important as the ingredients that went into your recipe. If you’re not familiar with the term, plating is “the practice of arranging food in an attractive and appealing manner on a serving plate” (thanks to WiseGeek for the well-worded definition). Presenting your online content in the right way and making it easily accessible can make all the difference. Using hashtags, shortlinks, posting during peak usage times, optimizing for search and posting to the appropriate social platforms are just a few ways to ensure the online campaigns you worked hard to cook up reach your audience piping hot and looking great. Also be sure to include a healthy amount of cross-linking between your social platforms and content pieces so users get a taste of everything you’ve got! In addition to the presentation of your efforts, getting feedback and raising a glass for the occasional toast can make everything taste that much better. Respond, converse, and encourage people to try everything on the plate. Personable engagement with your audience will keep them coming back for second helpings! Thanks for reading my recipe for social media success. For more digital marketing deliciousness, follow me on Twitter at @HelloPresto. Bon Appetite and be sure to tip your waiter. Let me start by saying I have a big phone. My iPhone 6 Plus has some of the best battery life of any smartphone on the planet and a fantastic screen. But those wonderful perks come at a cost: my phone is borderline obnoxiously big. If I’m sitting down, I usually have it on the table or desk in front of me, and I’m okay with that trade-off. But there’s one area that was, until recently, pretty annoying: trying to use the 6 Plus with one hand. Holding it from the bottom ensures your thumb will be at least an area code away from reaching anything on the top of the screen. Hold it from the middle, and a light breeze might cause it to slip out of your hand. Apple’s solution to this was double tapping the home button lightly to have the entire UI move down into thumb range. And while this feature is cute, it’s a band-aid for a design that’s bad for anyone with hands smaller than Andre the Giant. PopSockets are a clever little iPhone accessory that solves the thumb reaching problem with a little attachment to help you get a grip with your big phone. The awesome folks at PopSockets were kind enough to provide me with a PopSocket sample, complete with a snazzy Popticals logo. Thanks guys! The PopSocket attaches to the back your phone or case via a sticky material. Don’t worry it’s not going to gunk up your phone, and is easily repositioned. I’ve moved mine around three of four times since I started using it, and it’s left zero residue on my phone case. And the sticky material is still as secure as when I first got it. When the PopSocket is flattened, it sits only 1/8th of an inch tall which is nearly unnoticeable in your pocket. It pops out using the a polyurethane accordion with two heights: one that can rest on your fingers, and one tall enough to fit your fingers around. I find myself almost always using the latter. I usually go for a “spock” grip with the PopSocket positioned between my middle and ring fingers (as shown in the first image above). This allows me to easily reach every inch of my phone screen with my thumb. Plain and simple, it makes every interaction with my big ol’ phone a little easier. And considering how much screen time I have (and that you probably do too), that’s a big deal. I also sometimes use the PopSocket as a stand to prop up my phone for easy viewing. On a side note, if you get a PopSocket, you will pop it out and back down for no reason. Constantly. In meetings, while you’re waiting for things to load, while you’re talking to people. It’s addicting. PopSockets come in a wonderful array pre-made of color combinations for $10 a pop (pun fully intended), and the option to customize the base, accordion, and face for a small cost. I’d like to think I know great content when I see it, both online and off. Somewhere between talent, tact, knowledge and creativity, there’s a certain something that separates good content from great content. It could be a piece of art. It could be a video or a song. It could be a musical. When I saw the outstanding digital marketing (more on that below) and the talk surrounding Two River Theater’s Be More Chill, I knew that it would be great. Spoiler: it is. Without giving too much away, the plot to Be More Chill is about a young, painfully normal and unremarkable high schooler named Jereme Heere. Jeremy discovers a new experimental microprocessor called a “Squip” that comes in the shape of a gray oblong pill that, once swallowed, will activate an artificial intelligence inside his head, instructing him on how to be more chill. Not cool. Chill. The play is hip, energetic, vibrant and young. From the myriad of stylishly dressed characters, to the use of bright colors across backgrounds and lighting, Be More Chill is as much of a delight to see as it is to hear. The man behind the music is Mr. Joe Iconis, and every song is smartly written and incredibly catchy. Even as I write this, I find myself singing the opening theme or “I Love Play Rehearsal”, as if I myself have had a Squip implanted in my brain that only sings songs from the show. Every single member of the cast (only ten performers) is incredibly talented, and all get the singing spotlight at some point. One of the more memorable songs of the show for me was “Michael in the Bathroom” not only because it’s catchy (like all the songs), but because actor George Salazar did a knockout job with the entire scene. Here’s a taste. The colorful set design was also impressive and utilized well with quick scene changes that never missed a beat, all under a catwalk occupied by the Squip, symbolizing his existence only in the main characters mind. Behind the set sits the live band, performing every song and adding sound to every scene. Be More Chill is everything you could want in a fresh, fun performance to kick off the summer. But before I knew how incredible the show was, I was drawn in by the stellar marketing campaign surrounding it. I admittedly don’t see a lot of shows, but this one caught my eye. To be more specific, it wasn’t any of my friends recommending the show, but the marketing that got me interested. And to be even more specific, the digital marketing on social media was what really drew me in. Two River Theater has an outstanding digital marketing team and some very smart folks running their social media. They understand their audience on social, and how to story-tell on every platform. From the Be More Chill sunglasses, to the fantastic content across Instagram and Facebook, I had a very good idea of what Be More Chill would be like before I even stepped into the theater, and I was excited. Be More Chill has all the youthful energy that resonates perfectly with more artsy, 30-and-under users on Instagram, where Two River Theater pumped out lots of great content. And to top it all off, they offer $20 tickets for anyone under the age of 30. Styling the latest Popticals Sunglasses at Solitude for OR All Mountain Demo. Only two short weeks ago, I was enjoying the fresh air, beautiful views and all the latest gear at the Outdoor Retailer Winter Market in Salt Lake City. I was there representing Popticals, my favorite and objectively most stylish client showing off their new pop-out sunglasses to the outdoor industry’s finest. Over the course of the show I got to finally meet lots of folks from the online outdoors community that I’ve been talking with over the past year. You can read more about my adventures on the trade show floor and in the mountains of Solitude in my full recap post on the Popticals Blog. Keep an eye out for another post with all my favorite gear from the show coming soon. On my latest trip to St. Louis to visit one of my clients (check them out here, they’re awesome), I did something a little different: I took short video clips instead of photos. I hadn’t edited a video just for the fun of it in a while, and I had a song stuck in my head that was begging for some artsy travel footage. My connecting flight got delayed twice because of weather, so almost all of the video was edited in the airport and during the flight. Enjoy! For all my tech geeks out there, everything was shot on an iPhone 5 and edited in Final Cut Pro. Season 2 of Eat! Drink! Italy! is on Create TV! I’m excited to announce the second season of Eat! Drink! Italy! with Vic Rallo is premiering on Create TV this week! For those who don’t know, I work closely with a television show called Eat! Drink! Italy! with Vic Rallo. It’s a great program about Italy’s rich wine, food and culture shot on location with host Vic Rallo. Tune in for new episodes on Create TV or watch online at eatdrinkitaly.org. And of course visit the Eat! Drink! Italy! Blog for recipes, articles and lots of behind-the-scenes content from yours truly! Check out the Season 2 preview below and connect with Eat! Drink! Italy! on your favorite social sites! Mashable’s fifth annual Social Media Day is coming to Red Bank, NJ June 27-30! Thanks to Defined Logic, my home turf of Red Bank will be host to the RB Photo Crawl, a social media fueled photo frenzy. 15 spots around town will have props and prompts for photos, and uploading them using the #RBphotocrawl hashtag will enter you in to win some pretty swanky prizes. Visit rbphotocrawl.com for all the details and photo locations, and give me a shout on Twitter if you plan on venturing out in Red Bank for the event! This is a bit of a #ThrowbackThursday post, but my presentation on content marketing for NJ Connect somehow never made it on the blog! Last October (which now seems like years ago) I had the pleasure of being the feature presenter at NJ Connect’s Fall Meetup! My friend and fellow social media master Allison Pryor reached out with the opportunity and the topic of content marketing for the presentation. I decided to approach it by asking who, what, when, where, why and how content marketing works today. Below you can take a look at my presentation via Prezi (be gentle, it was my first time using this service!) and feel free to give me feedback on Twitter! Last week, the Popticals team proudly attended our first Outdoor Retailer Summer Show in beautiful Salt Lake City, Utah! What better place to show off the best sunglasses for sports? The bi-annual Outdoor Retailer shows take place every Summer and Winter and brings together the best and brightest of outdoor sports industry. An event this big could only be hosted at the larger-than-life Salt Palace Convention Center, located in downtown Salt Lake City where over hundreds of exhibitors set up across 679,000 square feet. We’re still not sure whether the inside or the outside was more impressive. This year we had the pleasure of attending the event as a new product exhibitor. After hours of putting together the booth, setting up monitors, and grabbing lunch from the delicious food trucks outside, the Popticals team was ready to show the world’s first pop-out sunglasses. The Popticals Team ready for action. When we asked Popticals President Tim Petsch if he could pop-out a pair of Popticals in under 6 seconds for a quick Vine video, his response was “6 seconds? I can probably do it in 4.” Here he is demonstrating how to take these athletic sunglasses from case to face in under 6 seconds (and look stylish doing it). A big thank you to everyone who came out to the show and stopped by the Popticals booth. We look forward to seeing everyone at the Winter show in January! Also, special thanks to High Roller USA for letting us snap some photos of Popticals team members Ted and Preston on the new Higher Roller Adult Big Wheel! This year Halloween got the short end of the stick, at least on the East Coast. Hurricane Sandy came barreling through knocking out power, destroying homes and shorelines, and disrupting my favorite damn holiday. This post was originally meant to be done before Halloween, but circumstances dictated otherwise. I feel a certain lack of closure for October, so pretend it’s Halloween and scare the living daylights out of yourself with some better-late-than-never guide to the scariest places on the internet. And remember: lights off, sound on. After asking “what is the scariest/creepiest thing you’ve seen online,” and dredging through some of the less-than-pleasant depths of the internet (thanks for all your horrifying suggestions), I put together the list of the top 5 ways to scare yourself silly on the internet. And please note, none of the shock/gore/not-safe-for-life suggestions made this list. I wanted it to be more scary/creepy, and somewhat safe for all ages (but for real, don’t show this stuff to your kids). Let’s start off with some good old fashion scary stories. Only instead of telling them around a campfire with friends, we’ll be reading them on the internet with complete strangers. 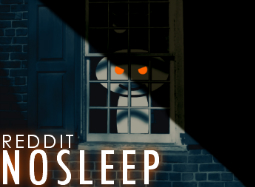 Reddit’s /r/nosleep community’s slogan is “because you weren’t planning on sleeping anyway,” and ain’t it the truth. Over 100,000 users subscribe and contribute to the community which is entirely dedicated to scaring the crap out of each other with original scary stories. No photos, no video, just text posts recounting terrifying encounters and first person accounts. To keep this from quickly devolving into a “hey that can’t be true” debate on every thread, r/nosleep is pleasingly specific on how to post and discuss stories, saying “Your story should be believable within reason… Remember, everything is true on NoSleep.” Read alone with all the lights off; there is no other way. Screamers are the horror junkfood of the internet. They’re good for a quick, panic inducing scare, but that’s about it. “Screamers” are defined by UrbanDictionary as “A YouTube video or a Flash game used as a practical joke to try and scare the viewer or the player abruptly.” These aren’t so much for you to view as much as “sharing” them with unsuspecting friends. Below are two classic screamers that might give you a mini heart attack, even if you’ve seen them before. And remember to put your sound up! This one is a manga-style depiction of an urban legend in South Korea. The story goes that the ghost of a distraught mother who committed suicide wanders around a district of Seoul (the Bongcheon district, not the Gangnam district) looking for her dead child. A teenager walking home encounters her and well… I’ll let you read the story and see for yourself. Click and scroll down to read. In September 2010, a user made a long series of posts on 4chan’s /x/ paranormal forums, claiming he had acquired a haunted version of Majora’s Mask for Nintendo 64. He posts videos and testimony of the haunting as it happens, telling of a “Ben” that previously owned the game who drowned. This first hand account is straight up scary, especially since it’s backed up by video of everything happening, and especially if you’ve played Majora’s Mask. It’s long, but completely worth it. The link below goes to a creeppasta site, and not to the original 4chan post (because the original post is gone, and because I don’t want to send any innocent souls to 4chan). Also is the first video in to get your heart pumping. The creator of Marble Hornets claims that “The following clips are raw footage excerpts from Alex Kralie. A college friend of mine.” The creator then goes on to say that Alex was making a film called Marble Hornets, but that something halted to production of the film, and began haunting Alex. When Alex said he was going to burn the footage, the creator persuaded him not to, offering to take it from him. Years passed, Alex moved away and was never heard from again, and the footage eventually made it’s way to YouTube. You can watch the introduction below with an explanation of the series. And don’t worry, there’s no scary things in this video, just the back story. The series starts of slow, but picks up in creepiness quickly, and new videos are still being posted about once every month. I hope you enjoyed my little list. If you need a stiff drink after seeing the horrors of the internet, I have just the thing: How to Make Skittle Vodka. Here’s the how-to video I posted from last year. Enjoy and don’t forget to share this post on Facebook and Twitter using the buttons up at the top! Who is The Social Media Chef? Hi, I'm Preston Porter, also known as the Social Media Chef. Using my background in writing, my lifelong love for new media, and my experience in marketing, I cook up winning strategies and bring a little of my own flavor to the world of social media.